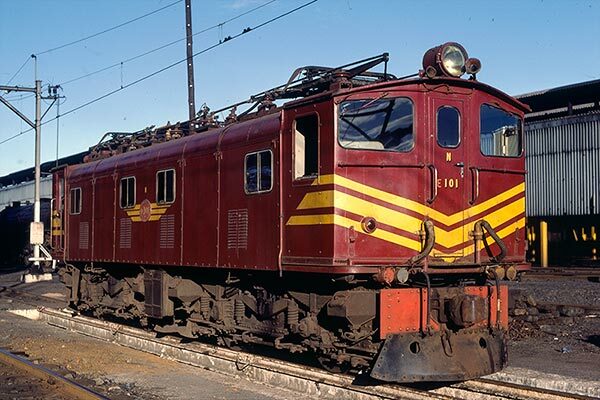 Caption - South African Railways (SAR) Class 1E Bo-Bo 3000 V DC electric E101 is seen at Masons Mill depot, Pietermaritzburg, in May 1981. Eventually numbering 172 locos the class was introduced to service in 1923. E101 is one of a batch of five, numbered from E98 to E102 that were built by Metrovick in 1936. The class dates from the first electrification in South Africa on the heavily graded line between Durban and Glencoe via Pietermaritzburg. Still in active use after 45 years of service the locos lasted until the early 1990s.